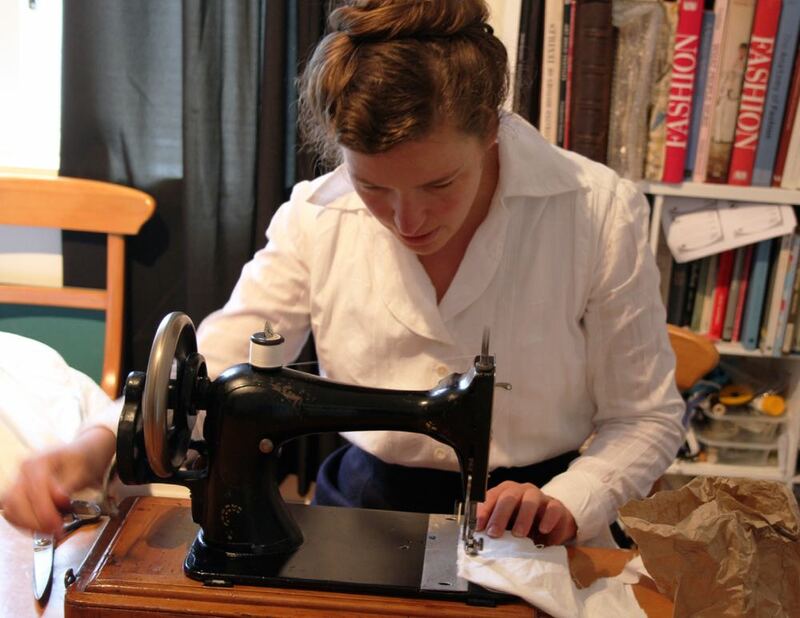 As part of my Fortnight in 1916 project, one of my goals was to make a garment using period techniques and my Singer 27 machine, just as a woman would have done in 1916. As you can see, I succeeded! It was quite an interesting experience, and I did learn quite a bit about sewing in the period. 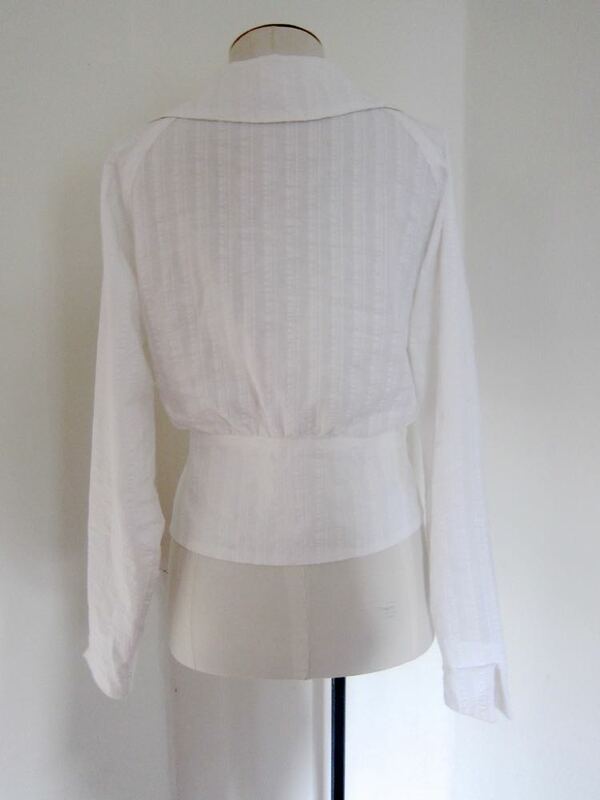 When I purchased the original blouse it was unfinished – the vestee part in front was only loosely basted in, and there was no front fastenings. I secured the vestee, and added hooks as a less invasive alternative to buttons and buttonholes. I’ve worn it once, as it’s extremely robust, and I really wanted to understand the fit. As my original was unfinished, it made it easy to study the construction. I’ll do a full post on the original shortly, rather than focusing on that now, but will note two of the interesting clues that it did yield. First, it was made from a commercial pattern as there are tell-tale notch marks in the seams. Second, it was also sewn on a vibrating shuttle machine, as you can tell from the way the stitches interlock. So, my reproduction is right on track as the type of thing a home sewer in 1916 would have made. I simplified the pattern slightly from the original: omitting the front vest, which a common style seen in fashion plates and patterns in NZ in 1914-16. Here, for example, is a dress pattern with an identical bodice. I had intended to make a second version with front vest within the Fortnight, but one of the things that I found in the Fortnight was that everything too SO MUCH TIME, so unfortunately that didn’t happen. The original blouse is made from a midweight (heavier than a quilting cotton) cotton with a jacquard woven foliate pattern. 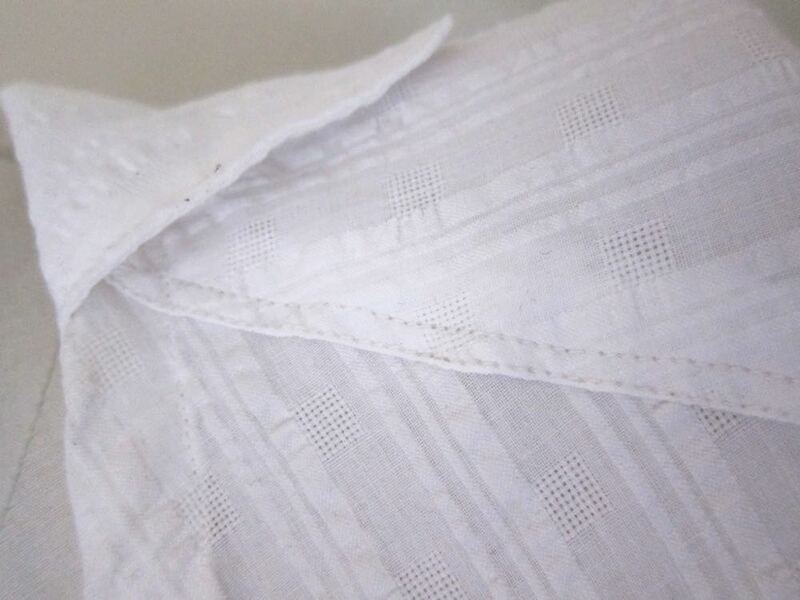 After searching, and searching, and failing to find anything even remotely similar, I settled on a check-and-seersucker cotton (from the glorious Lynne) that I already had in stash. 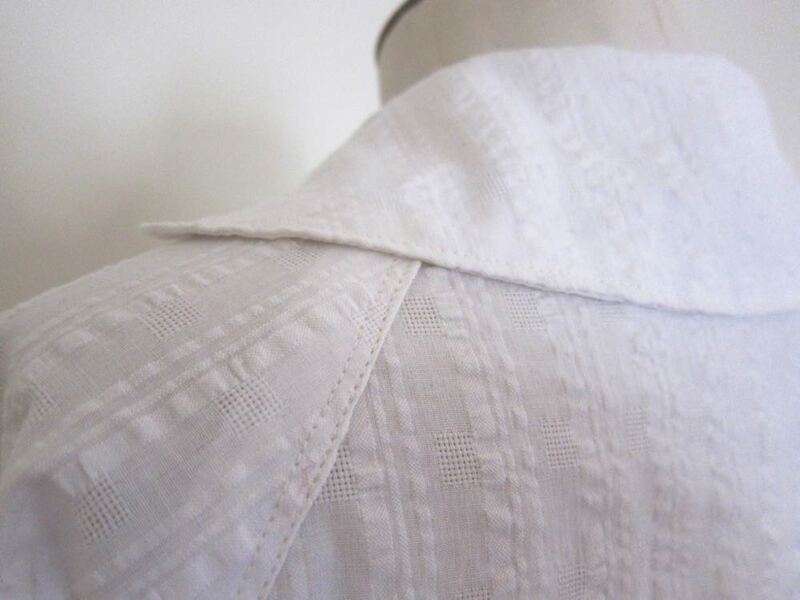 It’s not completely accurate to the period, as I’m not familiar with any references to seersucker blouses in the 1910s, but it should at least sew and wear in a similar fashion to the original fabric. Sewing on a hand-crank vibrating shuttle machine turned out to be much easier, more fun, and relaxing than I had anticipated. It definitely helped that I am an experienced seamstress, so didn’t have to struggle to control the fabric one-handed, but even with that aside, it wasn’t hard to crank and sew at the same time. There is a little bit of wibbling to the seams, and I had a bit of a problem with the thread getting soiled at first due to the recent oiling, despite all the practice fabric I ran through. Vibrating shuttle mechanisms create a VERY strong interlock. The stitching was extremely difficult to unpick. It now makes sense why a garment would be completely hand-basted and checked for fit before you sew it together. Normal vibrating shuttle stitches cannot be gathered without making the top tension very loose – and if you make it even the tiniest bit too loose you get horrid bobbles and knots on the bottom. 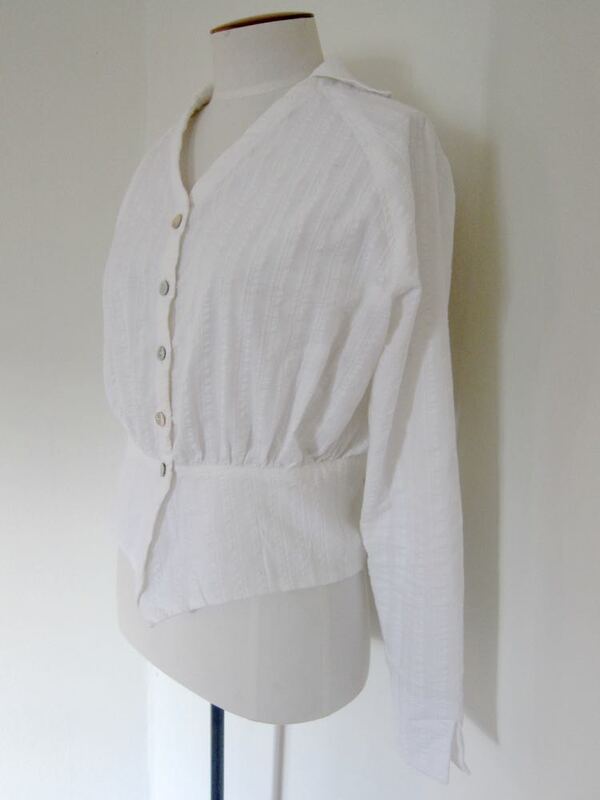 My original blouse was hand-gathered, which now makes sense, and is what I ended up doing. It’s very hard to maintain a 5/8″ (1.5cm”) seam allowance, or even a 4/8″ on a hand crank, which explains why some of my 19th and early 20th century patterns have 3/8″ seam allowances on many seams. The smaller seams aren’t just to save fabric: they make sense with the machine. As mentioned, I found the sewing to be easier than expected. In fact, it was actually really fun, and relaxing. The first week was quite hard, as sitting in my corset wasn’t comfortable yet, but once I got used to that, I really enjoyed every aspect of being on the rotary machine. Interestingly, I found it much easier to do small bits of sewing in around the rest of my task. Waiting for a kettle to boil? Sew two seams. Have half an hour while the laundry soaks? Set in the collar. Partly because the garment lent itself so well to segmented sewing, and partly because there was no mental block of turning on a machine, I got a lot more done in small bits, whereas usually I struggle to get any sewing done unless I have at least an hour to work with. While many period sewers must have tried to clear large spaces of time for sewing, especially for bigger projects like dresses, or if a sewing machine had to be gotten out and then put away, it also makes sense that a lot of sewing was done around all the other household tasks (so many household tasks…). Confession time: I cheated on the buttonholes. They were done with a modern machine. When I find fabric I’m really happy with, I’ll hand sew them. Sadly, the blouse turned out a size large for me. I was so paranoid about making it too snug, that I over-compensated. 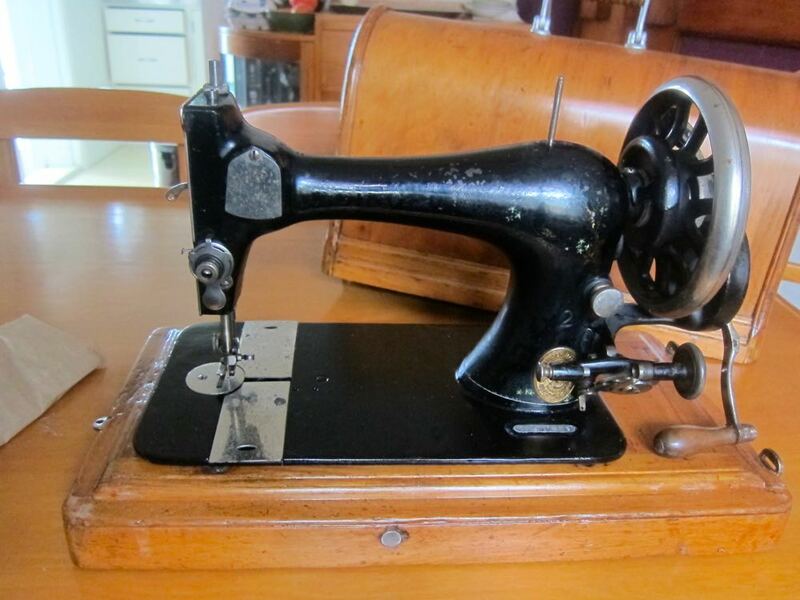 Sewing on the Singer 27 is something from 1916 I intend to carry into my everyday life. It’s certainly not the machine for everything, but for anything within that period it makes an enjoyable difference to a modern machine, and does actually effect the finished result enough to be measurably different. There are no photos of me in this blouse yet, but I’ll be wearing it at Costume College, and will hopefully have some soon. Oh, and it fits with the July HSF challenge! 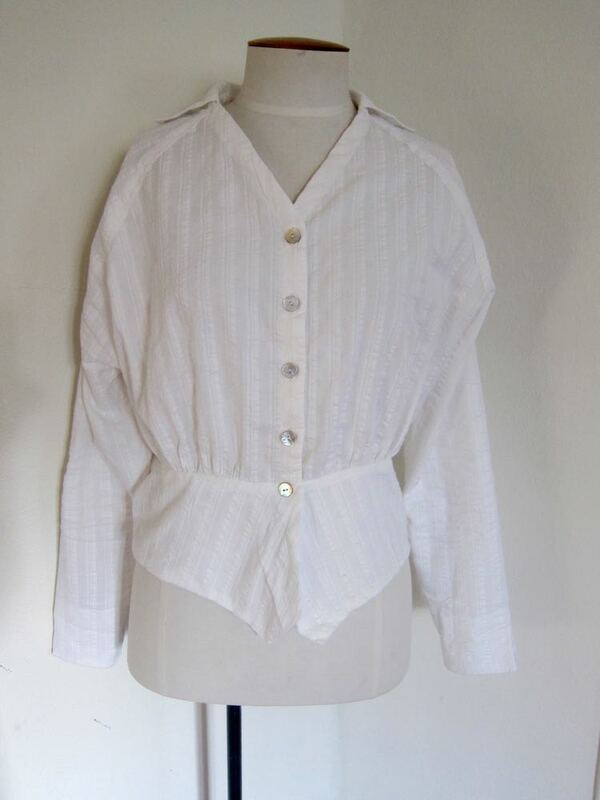 Pattern: My own, based on an extant blouse (which was, itself, made from a commercial pattern, so somewhere out there is a pattern for my blouse), with alterations based on other garments and patterns. 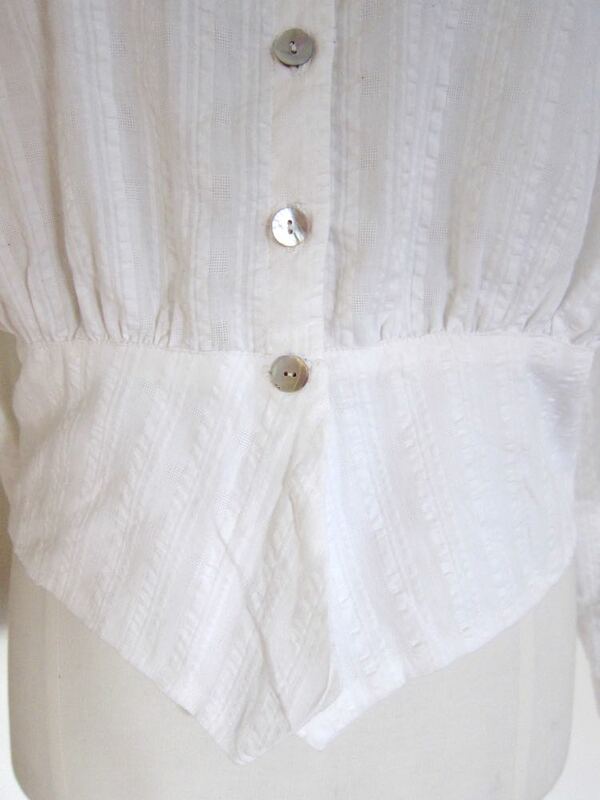 Notions: shell buttons, cotton thread. First worn: At least 3 times during my Fortnight in 1916.
sewcharacteristicallyyou.comSomeday I want to have a vintage sewing machine from the 30’s or 40’s since that is my favorite fashion period. I am glad that sewing was actually fun on your vintage machine. For the longest time I was prejudiced against old machines because of their age and not necessarily being in good working order. But they don’t make things like they used to, so if they are in good working order, I think I might actually trust it more than my computerized machine. Fascinating. Thanks for detailing the process. Details like stitching being hard to unpick do make sense of a lot and are really interesting. I have one of the first electric Singers. I need to get a new motor (the 3rd since my mother gave it to me when I was 8-I’m 54 now) It sews better than many modern machines! Also-as a surprise a few months ago, my dear hubby bought me a 1928 industrial Singer with all the attachments! It also needs a new motor, so I am anxiously awaiting the time I get to play with that! I really enjoy learning about your experience in 1916 and am looking forward to more posts! I hope you enjoy your old machine! cheers for Hot and Sunny Az! This is “sew” interesting! By the way, will this be a Scroop pattern? The comments are also great, because I love older appliances/technologies, and it’s neat to get a peek at their experiences. I’ve wondered why people used to baste absolutely everything. It seemed like such a lot of effort and I couldn’t see the value in basting every seam in a garment. Now I understand why they did it. 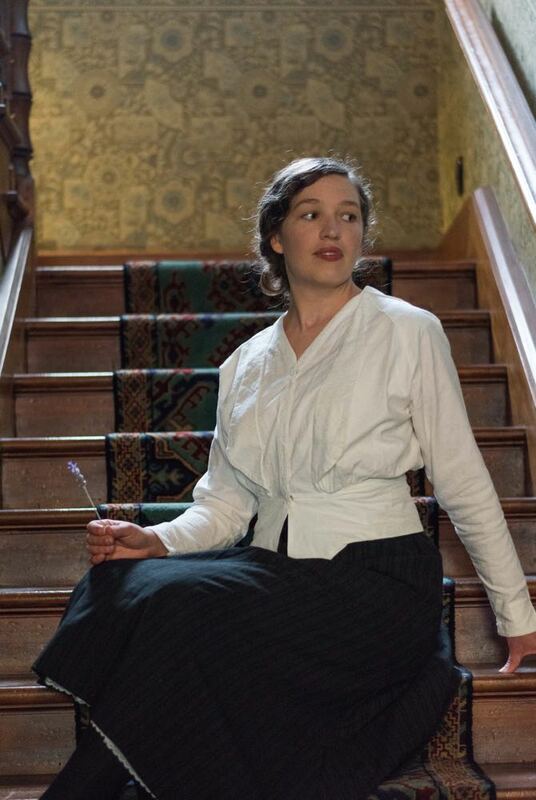 I’ve been really enjoying your 1916 fortnight, as I like so many of the clothes from this time to sew or sigh over. Very neat to hear your experiences. 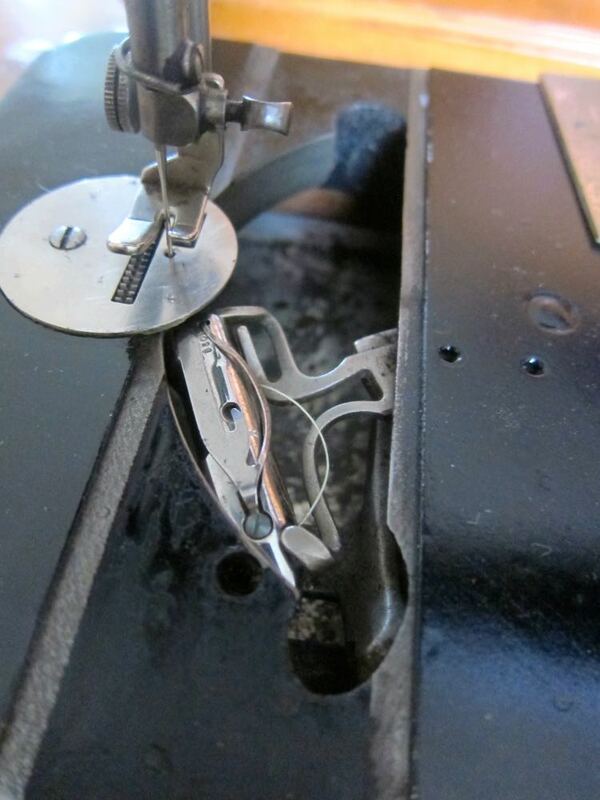 I sew on a 1904 Singer treadle machine and also get those nasty thread knots. I sew on a singer exactly the same as yours although I don’t think it is as old. It was my mother’s which would make it 1950s/60s. Whether it was given to her new I’ll have to ask. All the things you say about the tension and hand gathers is true – except it’s all I’ve ever used and don’t know any different. I thought all machines were like that! However, I’ve never really basted seams because you can stop sewing every few inches and take pins out – you never go so fast that the machine shoots off over pins. I like the gentle rhythm of turning the handle and guiding the fabric through with your other hand. My grandmother had a treadle singer, what sophistication – both hands free! You did an outstanding job on this…beautiful. And I think it fits you perfectly. Well done!